Below you can read the stories of some folks who, like you, are also members of our community. When you donate to ODC, you say “Yes!” to dance. You say, “Yes!” to supporting inspired high-school students, ground-breaking Bay Area choreographers, and talented young dancers. Say, “Yes!,” to dance and give now. ODC sat down with Isabelle Barroga, a fifteen-year-old member of the ODC Hip Hop Crew. What is the role of storytelling in dance? Dance allows me to tell the stories of my parents, my friends, my family – all the people whose stories I think need to be told. If there’s a situation that I don’t quite know how to handle, I’m able to tell that story through dance. During my solo for Uncertain Weather, I was able to express my feelings about someone very close to me, and her hardships, through a solo dance. It helped me get rid of my sadness for her. What does dance add to your life? Dance has added so many things to my life. When I was little I was so shy. I didn’t like talking to anyone. Even if we were in a restaurant and my mom said, “Go over there and ask for a napkin.” A napkin? Something so simple would make me cry in the middle of the restaurant. I didn’t like talking to people. In dance class, I could hardly talk to my first teacher. Through the years, dance taught me to be more confident. It taught me to speak when I want, to ask questions, to just be myself and be more confident in myself. What was it like choreographing your solo for Uncertain Weather? It was very terrifying. Switching from being a person in the back of the room who didn’t think she was very good at hip hop to being front and center on stage – whoa – that’s a big jump. In my section, Nicole gave me a lot of freedom. She guided me, and cleaned up what needed to be cleaned, and I was able to tell my story. I even got to bring some parts of my culture into it. There was a section where I screamed towards the crowd in Tagalog, and it was a good way to bring more of me into it. You’re trying to form a dance team at your high school? At my school, the Bay School, we realized for your after-school activity there were several options for sports or drama, but other than doing a play, there’s nothing to do with dance or the arts for your after-school activity. We decided to make a dance team and we talked to one of the athletic directors. She explained, “The problem is, they don’t want to give us a budget. They don’t think people are going to join.” We asked if we could prove ourselves, so me and three other people made a piece together and we’re actually performing for the first time, this Friday at the game. The athletic director told us that we would perform and if the other people in the athletics department like it, hopefully, they’ll give us a budget and some place to practice. It’s still in a process. It’s not a definite thing, but we’re trying to make it happen. Why do you say, “Yes!” to dance? I say "Yes!" to dance because it has given me so much. It gives me a way to express my opinions and emotions and a way I stop thinking about the stressors in my life. Say "Yes!" to dance and give today! ODC sat down with Nicole Klaymoon, the Founder and Artistic Director of the Embodiment Project. Klaymoon is also a co-director of the ODC Hip Hop Crew and a current ODC Theater Artist in Residence. How has being an ODC Artist in Residence helped you as an artist? 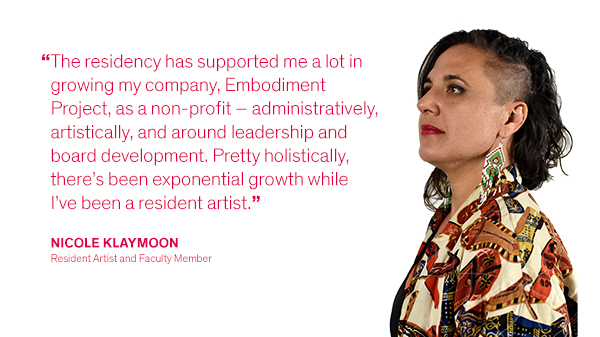 The residency has supported me a lot in growing my company, Embodiment Project, as a non-profit – administratively, artistically, and around leadership and board development. Pretty holistically, there’s been exponential growth while I’ve been a resident artist. Brenda Way, my advisor for the residency, is a businesswoman. She’s a badass. She has a very compelling skillset around getting people to invest in your vision. I see her as an elder who wants to pass the torch. She wants the next generation to surpass her. She has the maturity and wisdom to do this with grace. I feel held, supported, and seen in our relationship. She’s very maternal, and nurturing, with such generosity to share her own process and insecurities. So, she’s been key. There are resources, like the Administrative Fellowship, that have provided us so much support. I wish such a resource for any dance-maker who has a company. There’s so much administrative work that goes into it sustaining your work. There’s so much upkeep, especially if you’re getting grant funding with all the reporting and the paperwork. It can take away from our ability to do what we’re getting the funding to do. The Administrative Fellowship has helped me to understand, that when you have the support, there’s so much more you can get done. How has ODC built community among Bay Area Artists? ODC is a heart in the Bay Area dance ecosystem. I love being in the café, because I’ll see a choreographer, then another choreographer, and I can just feel the presence of the dance community. ODC has really supported a lot of key individuals and it continues to be a place where you’ll see art-makers of many disciplines - just seeing people in passing – having a space that draws in important voices, whether they’re here to teach class, or take class, or if they’re a part of Sandbox, or hosting an audition, or this is where they rehearse or are doing a show in the theater. You just see folks. This space is associated with people who are actively pursuing dance and performance as their livelihood. That is really unique. I lived in LA for six years. That was what I longed for – a central unifying space. We’re constantly telling our story in how we move, what we walk with, what our bodies carry, what we have lived through, what has been repressed, and what is our legacy. Our ancestral lineage, our family lineage, where we hold our pain, where we hold our joy. I’m constantly humbled by the intelligence of my body and what movement reveals to me about who I truly am. Body movement is how we really learn our authentic nature, especially with improvisation, street dance, or freestyling. I could watch someone freestyle for three minutes and understand who they are in their nature. I see you. Okay, now I know you. One of my mentors, James Bell, he’s a restorative justice leader. He says, “The ills of humanity are cured by more humanity.” That’s what dance does; it gets us in touch with our humanity, our empathy, our rawness, our needs, and our emotional intelligence, which transcends spoken language. ODC sat down with Mia J. Chong, an apprentice with the ODC Company. Chong is also a former ODC School scholarship recipient and an alumna of the ODC Dance Jam. What made you decide to become a professional dancer? How will you be involved with dance as you get older? My long-term vision for dance has definitely been modeled after KT, Kimi, and Brenda. As a little girl, they showed me what three strong, female artistic leaders of an organization looked like, and now as a young woman they empower me to be just as bold and influential. That’s really important to me. I eventually want to transition towards the directing and choreographing side of the dance world and ODC has been really great about giving me space and resources to explore other facets of dance. How has your background as an ODC School student and Dance Jam member prepared you for life as a professional dancer? My experience in the ODC School and as a Dance Jam member has really served me as a professional dancer. The ODC School really embeds sophisticated artistic values into your training from such a young age – values like balancing technique and athleticism, being a unique artist, and caring about the dance community, as a whole. At ODC, you’re not going to be told or given things all the time; you’re going to have to create, and you need to know what your creative identity is. Can you talk more about the phrase “creative identity”? The concept of creative identity is something that Kimi helped cultivate when I was in the Dance Jam. When we were teenagers, we were already being asked to think about the kind of work we wanted to be in, the kind of work we wanted to create, the kind of dancer we wanted to be. I think that having people ask you those questions as you’re growing up forces you to figure out what your opinions and stances are, creatively and artistically. KT also constantly reminded me when I was growing up in the school that, “The things that make your dance unique are the things that should continue to be the focus of your work.” Instead of trying to normalize everyone, or mass-produce the “perfect” dancer, they were really into the idea of each of us developing as distinct individuals. After you graduate from the Dance Jam or the ODC School, you shouldn’t dance or think like anyone else. Why do you say “Yes!” to dance? I say, “Yes!” to dance because it is an ongoing process that will be a part of my life for as long as I’m alive. The struggles, the triumphs, the beautiful moments you experience either as a performer or an audience member, the giving and receiving process - it’s just endless. I recently spent time hiking on Mt. Rainier. For two full days, I thought about the magnificence of nature and the exhilaration of physical momentum. It was glorious. Perhaps imagination finds its roots in the wild beauty of nature. And now, back at sea level, I am contemplating what keeps us going, what fuels our spirit and gives us joy- most particularly in the face of current political winds. I see young dancers of every stripe in ODC’s youth program performing with startling energy and originality. And the senior tappers, the world dance enthusiasts, and the Rhythm & Motion workout devotees, likewise, joyfully realizing their talents, newfound or established, in every class and performance. At the same time, artists from the Bay Area and across the country captivate and fire up our curiosity at ODC Theater. Kate Weare’s urgent sensuality, Hope Mohr’s keen and visceral intelligence, … there is something invigorating and essential here. Science knows the fundamental necessity of a diverse bio-system and, on the cultural level, we see the glory of it on a daily basis at ODC. We are a safe and nurturing home to it all. Safe, yes, but with doors wide open! And while the ODC Dance Commons community is bustling here at home, the dance company has been appearing and making waves, (of a good kind! ), with audiences across the country. In September, KT spent three weeks in Kansas with 25 teenagers, creating a companion piece for our collaborative work, “Boulders and Bones”, to precede ODC’s appearance at the Lied Center there. Performances at Brooklyn Academy’s Next Wave Festival, The Granada Theater in Santa Barbara, Zellerbach Hall in Berkeley and Northrop Auditorium in Minnesota all included intimate community residencies as well as exhilarating standing room only performances. On and off the stage, we are touching lives and shifting expectations through our art. These days, we are called to resist. But equally, we need to affirm. 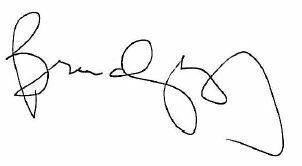 Please join me in saying yes to the arts, yes to physical engagement, yes to the joy of dancing together, of being together, of celebrating the gift of choice in our lives. I urge you to make the choice to contribute to ODC, its home, its many programs, its artistic vision and its optimistic ambitions for a thriving, resilient and increasingly creative community. Together we can keep that light shining! Please contribute generously.